Over the past several years, the government of Israel has intensified its two-pronged Jerusalem strategy to consolidate control over East Jerusalem while eroding Palestinians’ hold on the city. This dual approach is being carried out both on the periphery of the city and within the heart of East Jerusalem – the Old City and surrounding band of Palestinian neighbourhoods. Israel is actively working to redraw the boundaries of Jerusalem through legislation and political proposals to both territorially and demographically reshape the city. In parallel, it is asserting its power in the core of East Jerusalem by promoting an unprecedented number of touristic settlement initiatives inside Palestinian neighbourhoods, advancing evictions and uprooting Palestinian families, demolishing homes (throughout East Jerusalem), tolerating pressure from messianic Temple movements to challenge the status quo on the Temple Mount/Haram al Sharif, stepping up policing activities under the guise of ‘governance’ and compounding stress on everyday life for Palestinians in the city. 1) A shift in the Israeli political landscape from a post-Oslo/post-Second Intifada paradigm of ‘conflict-management’, under the pretence of receptiveness to a two-state solution, to Israel now taking steps to unilaterally determine the permanent terms of the conflict – terms that exclusively reflect the agenda of the Israeli right wing and that substitute annexation and entrenched occupation of an unsustainably fragmented Palestinian space for an agreed upon solution. 2) A radical shift in US policy in the Middle East that is serving to diplomatically and symbolically buttress Israel’s policy on Jerusalem. Whether or not a prospective Trump plan (viable or not) reaches the table, the move of the US Embassy to Jerusalem, appointment of a US ambassador to Israel with widely known links to the settler movement, and the president’s casual declaration that ‘Jerusalem is off the table’ have already considerably destabilised conditions for any prospective peace process. To illustrate the immediacy of the causal effect of US policy: President Trump, in his November 2017 unilateral declaration on Jerusalem as capital of Israel, stated that his intention was to simply acknowledge the current reality in the city (a problematic assertion in itself given the unresolved conflict in Jerusalem), without taking any clear position on the borders of the city. But the context in which the president made his declaration immediately invalidated his pledge not to take a position on borders. For months, members of Knesset and the Israeli cabinet had been advancing numerous bills and plans to unilaterally alter the boundaries of the city toward their own political and demographic ends. Within 24 hours of Trump’s declaration, one of those bills came back onto the Knesset agenda and by early January, it had passed into law with minor modifications. The president’s declaration therefore provided thrust for three determinative trends on the ground today. in order to cement the reality of a Greater Jerusalem already physically outlined by the route of the Separation Barrier. In June and July 2017, two bills were introduced to the Knesset by members of the coalition: Amendment 2 to the Basic Law: Jerusalem, Capital of Israel and the Greater Jerusalem (or Daughter Sub-municipalities) Bill. Together, these bills (one since enacted into law, with minor modifications) were designed to substantively alter Jerusalem’s boundaries toward the goal of the de facto annexation of the three settlement blocs surrounding Jerusalem: Gush Etzion, Ma’ale Adumim/E-1, and Givat Ze’ev. Depending on the proposal, these blocs would be subsumed under state or municipal (Jerusalem) authority; in the latter case, by artificially adding some 140,000 settlers to Jerusalem by eventually granting them the right to vote in municipal elections  . Beyond the goal of annexation is the intention to transfer some 120,000 Palestinian permanent residents of the city (1/3 of the entire Palestinian population of East Jerusalem) who live within the municipal boundary but were left outside the Separation Barrier when it was erected  . These Jerusalemites would remain physically in place but the boundary would be pulled in to leave them outside of municipal jurisdiction. In other words, although the land on which they live would remain under Israeli sovereignty, it would no longer be considered part of Jerusalem. The Palestinians living in the neighbourhoods beyond the Barrier are already obligated to enter a checkpoint to get into their own city; under new plans, they would be removed altogether. Recommendation: While serious actions must be taken to oppose Israeli steps to annex additional territory (either to a state or to a municipal body), pressure must likewise be brought to bear on moves designed to transfer Palestinians from Jerusalem via plans to reinvent the boundaries of the city. In parallel, steps must be taken to fortify the Palestinian collective existence in the city within and outside the Barrier through substantial economic investment, protection of permanent residency status, promotion of planning rights, and political and financial support for Palestinian institution building. It is important to stress that meaningful economic investment in East Jerusalem must not come at the expense of a viable political resolution to the conflict or be used to solidify plans to redefine the boundaries of the city. A recently announced government plan to invest 1.8 billion shekels in East Jerusalem must be carefully analyzed and closely monitored to ensure that 1) resources will be equitably invested in the neighborhoods beyond the Separation Barrier, often omitted from proposals to increase budgetary support to East Jerusalem; and 2) investment is not used as a system of carrots and sticks to deepen control over the Palestinian population, e.g. by premising educational funding on adoption of the Israeli curriculum. The private settlement compounds being built in the Old City and its circumference (where roughly 2,500 settlers are now quartered) cannot be quantitatively compared to settlement building in the ring neighborhoods of East Jerusalem but qualitatively, they have disastrous implications for Palestinians in Jerusalem, the relationship between Palestinians and Israelis in Jerusalem, the two state solution, and the Old City as home and historic center of the three major monotheistic world religions. a. In Sheikh Jarrah, where plans were frozen for many years prior to a major announcement of plan promotion last year, there are now 75 families at risk of eviction. The settler leading the crusade is a city councilperson. b. In Batan al-Hawa, Silwan, an entire community of up to 100 families is at risk of eviction; some 17 have already lost their homes. This wholesale campaign is the single largest settlement takeover operation since the annexation of East Jerusalem in 1967.
c. The General Custodian, in charge of managing the disposition of assets owned by Jews prior to 1948 (a right reserved for Jews only), has repeatedly demonstrated bias by favoring Jewish trusts that claim ownership of Palestinian homes. While these trusts may have once been linked to original Jewish owners, they are now run by settlers who have no established connection to them. In this way, the state is directly abetting the development of settler compounds within the hearts of Palestinian neighbourhoods in and around the Old City. 2) Touristic settlement, via both direct Israeli management and privatization of sites to radical settlers, enables Israel to impose a singular Jewish nationalist narrative onto the Old City and environs – a narrative with the power to influence the hearts and minds of hundreds of thousands of people a year, from Israeli school children to tourists from around the world. At the same time as altering the religious and cultural character of the area, these plans wreak physical damage to the environment by imposing massive new structures (prospectively including a theme park-like cable car line being fast tracked outside of the customary planning process) onto the delicate fabric of the Old City and surrounding neighbourhoods. 3) While a major topic unto itself, it is important to note here the pressures on the status quo at the Temple Mount/Haram al-Sharif – another example of the state working in cooperation with radical, ideologically motivated groups. In this case, the state is helping to bolster Temple Movement activists who are mission driven to topple the status quo, as a means of deepening the Israeli presence and challenging current arrangements, including Muslim management of the holy site. Exemplifying this pattern, just last week Prime Minister Netanyahu announced that he would lift the ban – in place since 2015 – on government ministers and Knesset members making ascents to the Mount, resulting in immediate visits by prominent right wing figures. These ‘visits’ are the short-term manifestation of a radical agenda promoted by Temple Movement activists who seek to fundamentally change arrangements at the holy site and in the long-term, to realise construction of the Third Temple. Recommendation: It is vital that the traditional calculus of settlement building be readjusted to 1) treat these coordinated efforts to consolidate control of the Old City and surrounding Palestinian neighbourhoods with the same urgency afforded to settlement building throughout the whole of East Jerusalem; 2) ensure a holistic response that regards private settlement inside the Old City Basin and touristic settlement not as individual phenomena but as multiple elements of a unified and politically lethal strategy. Recommendation: Cultural, religious, and academic institutions and professionals can serve an important role in researching, reporting on, and advocating for the safeguarding of the pluralistic and multicultural nature of the Old City; preventing touristic settlement building; halting evictions and demolitions; and protecting and strengthening the Palestinian community in and around the Old City. Since 1967, Israel has revoked the permanent residency status of more than 14,600 Palestinians. Revocation of permanent residency has become a primary tool for displacing Palestinians from the city. The unilateral plans already discussed aim to transfer more than 120,000 Palestinians from the city, effectively revoking their permanent residency status. The number of demolitions in East Jerusalem has skyrocketed over the last several years. In 2016, the number of demolitions tripled from the prior year to a record 203 and last year to 173 (half of them home demolitions). The Municipality claims most of these demolitions are for unpermitted building. The burden on Palestinian culture: The closure of Palestinian cultural and political institutions since the Second Intifada leaves the community without critical communal infrastructures. No more than 20 Palestinians are allowed to gather for cultural events. This past Ramadan, several Musaharati – responsible for the call to prayer – were detained. This is but a sampling of the ways in which authorities obstruct Palestinians’ freedom to enjoy their cultural and religious life in the city. Arguably, the most significant threat to Palestinian culture is the perpetuation of gross disparities in Jerusalem’s education system. There is a current dearth of more than 2,600 classrooms in East Jerusalem and, consequently, there are now more children attending ‘recognized but unofficial’ schools (private or for-profit institutions licensed by the state but offering a substandard curriculum, often in unregulated buildings) than municipal schools. Moreover, funding for Palestinian education is often contingent on acceptance of the Israeli curriculum. Recommendation: Substantive actions and investments must be made to build the capacity of the Palestinian community to resist displacement from the city – including but not limited to strengthening of Palestinian institutions, protection of permanent residency status, reduction of socio-economic disparities in the city, and confronting endemic discrimination in the planning process that prohibits the growth and development of Palestinian communities. It is imperative that heightened vigilance be directed to the intensifying trends described herein – in the core of the city, on its boundaries, and against the Palestinian community throughout the city. Simultaneously, those committed to a two state solution must hold the line of defense against the two settlement projects widely considered to be the principal threats to the viability of a two-state solution: 1) the E-1 plan for construction of almost 4,000 housing units and large-scale commercial and industrial development next to Ma’ale Adumim, which would fatally break contiguity between East Jerusalem and the West Bank on the eastern flank of the city; 2) the plan for 2,600 housing units in Givat Hamatos, considered to be the linchpin in Israel’s strategy to decisively entrench its control over the southern perimeter of the city. Last year, industrial drilling for the purpose of soil analysis signaled the looming potential to announce building tenders in Givat Hamatos. While large-scale construction plans in the E-1 area have not been advanced since the end of 2012, over the last several years Israel has conducted various activities prerequisite to construction, including completion of the northernmost section of the Eastern Ring Road and checkpoint, and legally paving the way for the long threatened expulsion of the Bedouin community in Khan al-Ahmar, only recently delayed due to strong local and international protest. 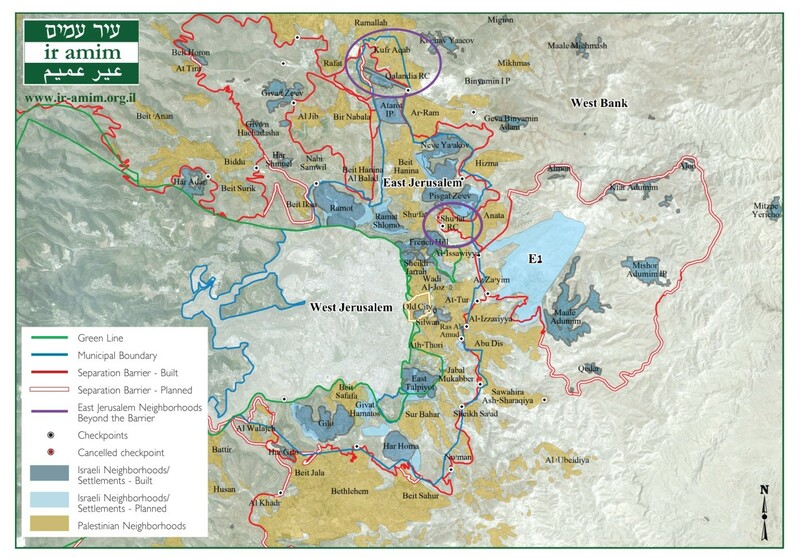 Recommendation: While sustaining pressure against the evacuation of the Bedouin community in Khan al-Ahmar, steps must also be taken to prevent the tendering of Givat Hamatos and to proactively address the myriad developments prerequisite to construction in the red line areas, including national park plans to physically bridge Jerusalem and E-1 and road infrastructure projects designed to route settlers from the West Bank into Jerusalem while diverting Palestinians from the city and a future settlement in E-1. Such plans are ostensibly harmless but in fact essential to the realization of E-1; and the steady, incremental advance of these plans should be cause for apprehension, particularly in light of a US silence that renders long established red lines increasingly tenuous. In the absence of a permanent solution to the conflict in the foreseeable future, the two national groups in Jerusalem – Israeli and Palestinian – will continue to share a complex urban reality dependent on a delicate weave of symbiotic relations. In this reality, policies should be adopted to enhance the living environment in the city and the personal security of all its residents and to reduce, to the extent possible, factors that exacerbate tension in the city. 2) Pressure on the Israeli government to secure a full stop on evictions in the Old City and its circumference – most critically, in Sheikh Jarrah and in Batan al-Hawa, Silwan, where an entire community of roughly 600 men, women and children are at risk of displacement. Recent protests have demonstrated the effectiveness of intervention in Khan al-Ahmar; determined, proactive measures must also be brought to bear in Batan al-Hawa, which has equally disastrous implications in terms of both humanitarian and political impact. Mobilising opinion makers and public opinion in both societies behind an inclusive and innovative peace agenda.